As much as I love fish, salmon especially, I don’t like pan-frying it on the stovetop, not because it doesn’t taste good or takes too long, its both ridiculously tasty and easy to make. My dislike for pan-frying preparation comes from the fact that I’m left to clean up after it’s greasy, fishy aftermath. I often fear for all the soft textiles the apartment since the aroma a fried foods wafts in the air long after the meal and after the kitchen has been cleaned and all of the grease-splattered surfaces scrubbed down. So, as you can imagine, in lieu of crispy, caramelized pan-fried salmon, I am happy bake and braise my fish, which means less mess to clean and no worries of lingering odors. 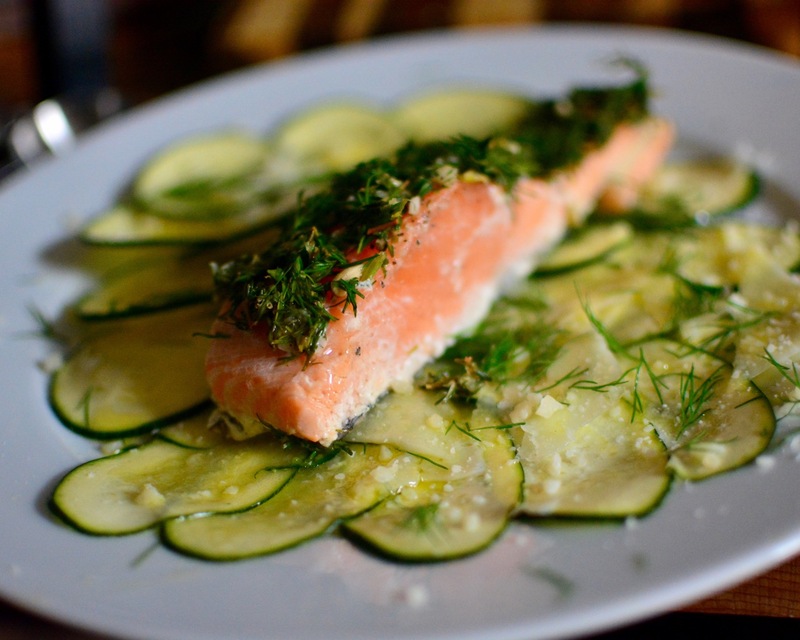 Braised Salmon & Fridge-Foraged Herbs served with Zucchini Carpaccio. Find the recipe here. 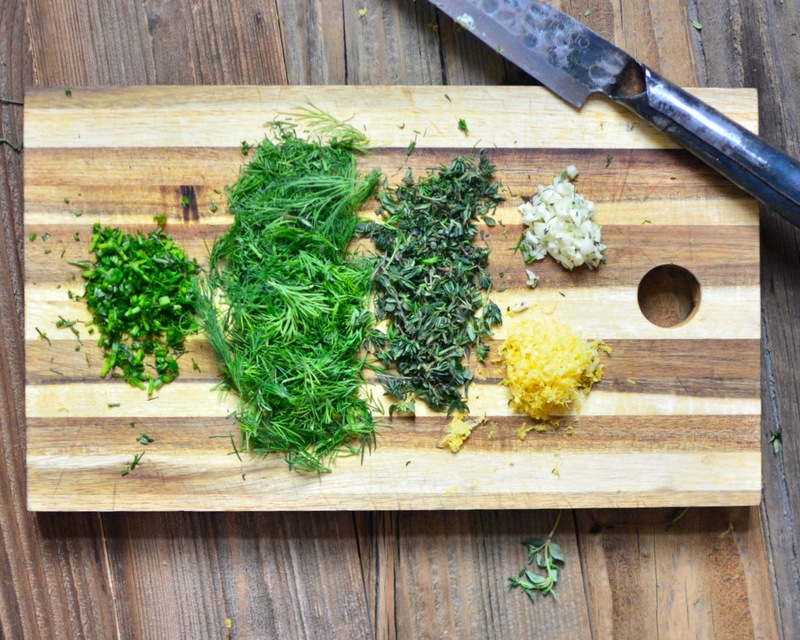 In a small mixing bowl, combine the herbs, chopped scallion, garlic, the zest and juice from the lemon, ¼ teaspoon sea salt and ¼ teaspoon pepper. Stir to combine. Next, drizzle 2 tablespoons of olive oil onto the salmon filets and season them with sea salt and pepper, about ½ teaspoon of each. Rub the oil, sea salt and pepper onto all sides of the fish. Then, place the fish into a ceramic baking dish or parchment-lined, deep baking tray (skin side down if you’re using skin-on salmon) I tend to reassemble the filets back into its original form by setting the filets against one another. I think this keeps them from drying out and having one uniform surface makes it easier to spread the herbs. 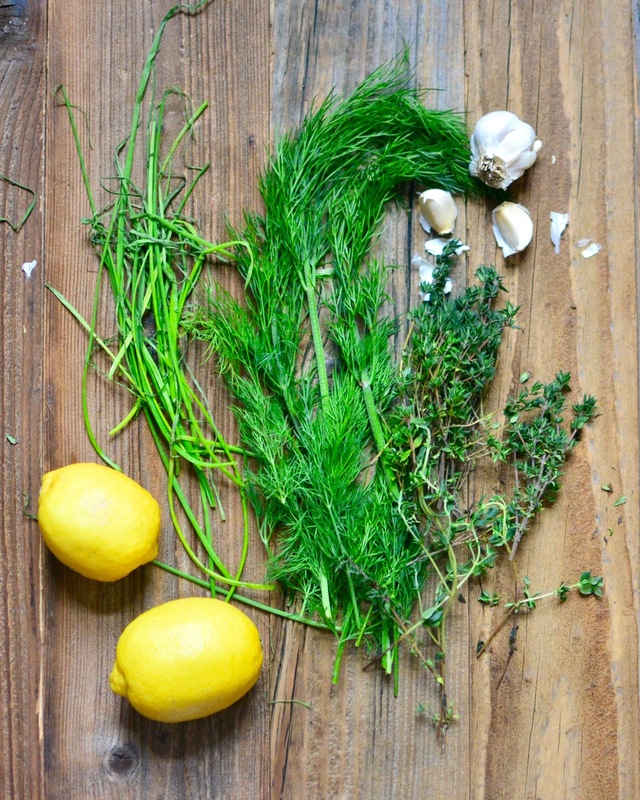 Return to the bowl of herbs and drizzle onto it 1 tablespoon of olive oil and stir. 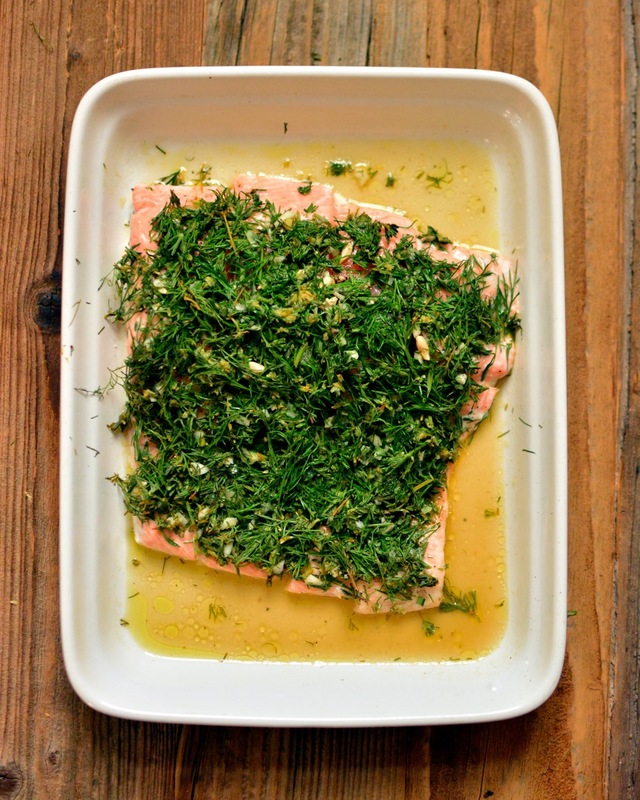 Then, spread the herbs evenly over the salmon filets. Tightly cover the baking dish or tray with aluminum foil and bake in the center of the oven for 15-18 minutes, depending on the thickness of the filets. After baking, simply turn off the oven, open the oven door and allow the fish to continue cooking in the ovens heat and in its steamy foil tent for anther 10 minutes. You can use this time to prepare a side salad to serve along with it. I’d recommend making my Zucchini Carpaccio, which you can find here.